I have always been intrigued by preserved lemons. Seeing the bright yellow orbs afloat in glass jars on shelves of specialty and ethnic food stores always captured my imagination – they seemed to me like delicious, edible lava lamps. 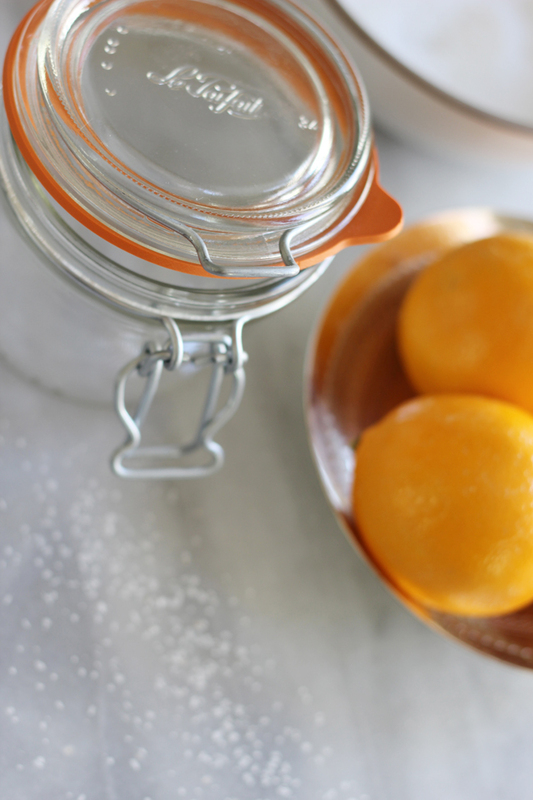 Preserving citrus is an ancient technique, but I only recently realized how easy it is – really, the salt does all the work for you. 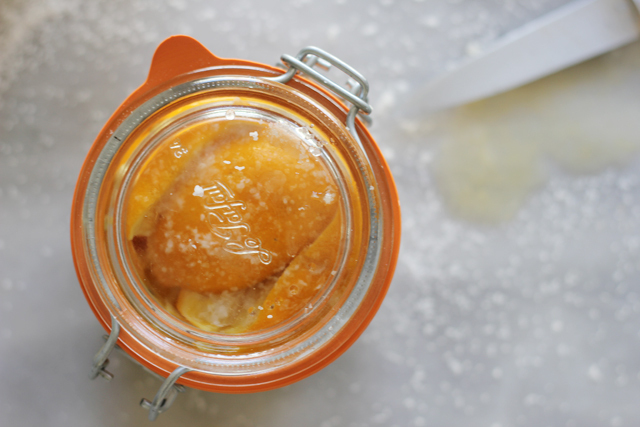 And preserved lemons have so many uses – they can be tossed into salads, melted into pasta sauces or used as a garnish alongside fish or oysters. They liven up any dish with their citrusy brightness, yet can be eaten whole as the salt mellows out their tartness and acidity. 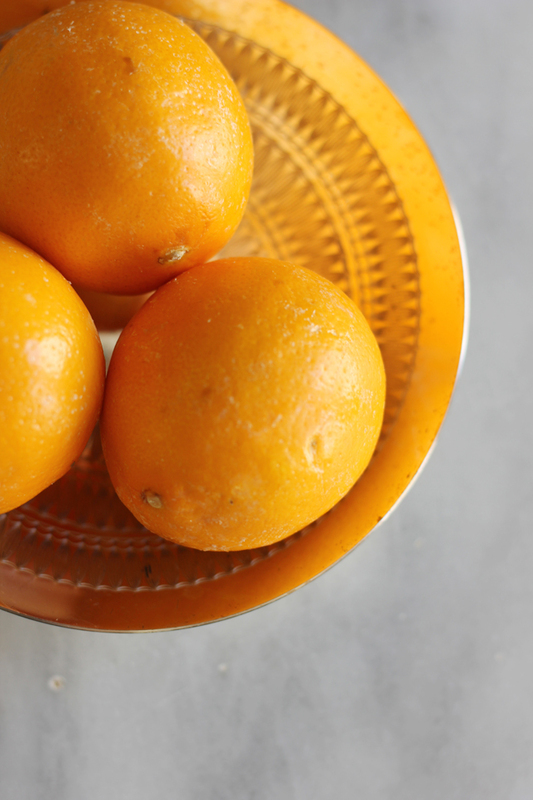 A great way to transition winter citrus into spring. Step 1: Rinse lemons thoroughly and dry with paper towels. 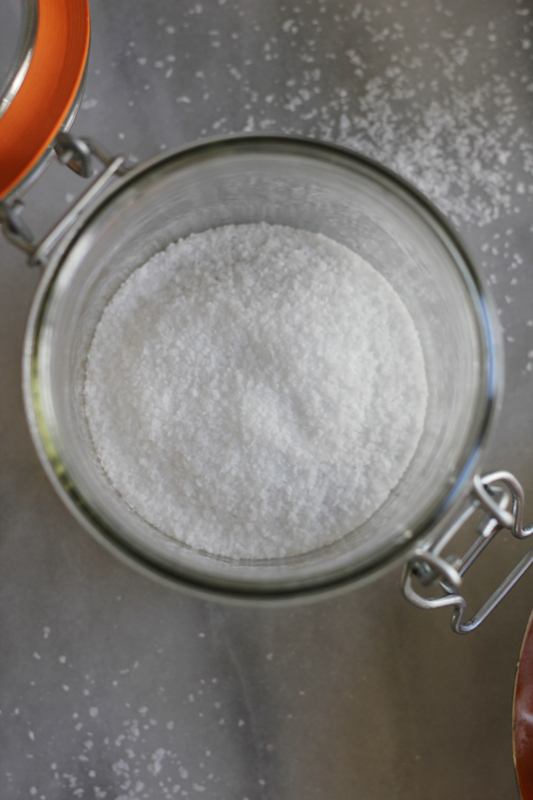 Step 2: Fill the bottom of a tightly sealable glass jar with Kosher salt until it reaches about 1/4 inch up the sides of the jar. Step 3: Slice lemon in half from the top down, but not all the way through lemon. Turn the lemon 90 degrees and slice lemon in half from the top down again, but not all the way through the base of the lemon. You should have a nearly quartered lemon when you are through. 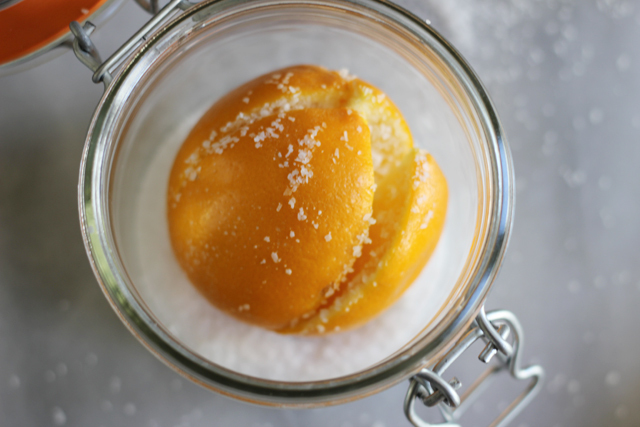 Step 4: Liberally salt the inside of the lemon and place into jar. Sprinkle the entire lemon liberally with additional salt. Pack lemon down firmly. Step 5: Repeat steps 3 and 4 until the jar is full of lemons. Sprinkle top of lemons liberally with additional salt. Seal jar tightly. 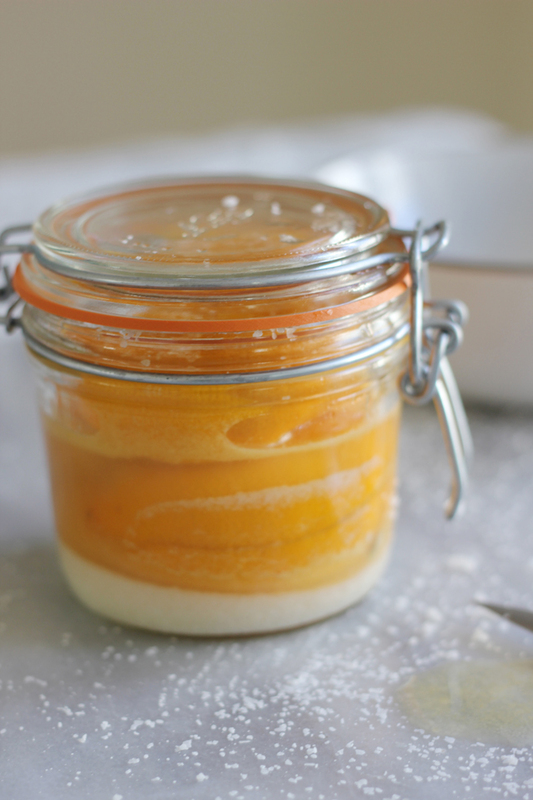 Let sit at room temperature for at least 4 days, turning jar gently to re-distribute salt. 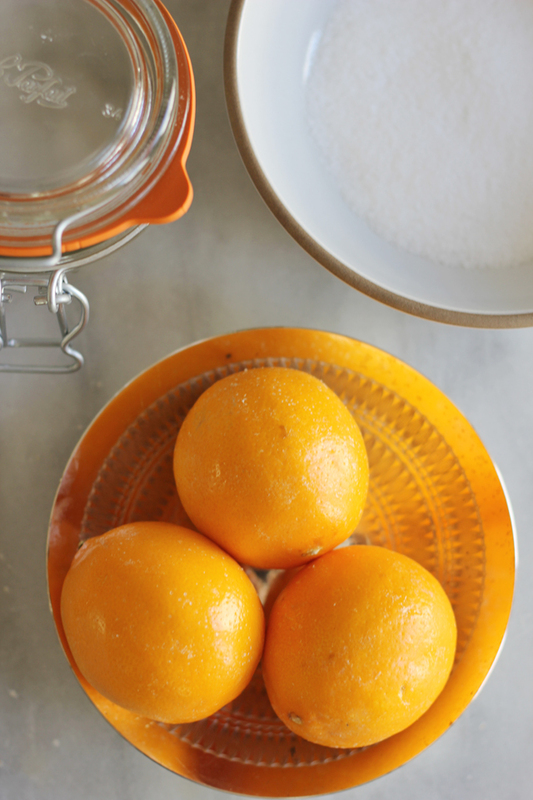 Step 6: When desired preservation is reached, rinse lemon thoroughly with water to remove extra salt. I love the way you did yours. Beautiful photos as well! Lovely post, as always. And I love preserved lemons. Delicious! great instructions and photos to go along! Oh my thats so easy!! Thank you for posting this. Must try!! Awesome. I absolutely love your blog and what you and Victoria did with it. Thanks for sharing! Fabulous, so simple and such a versatile pantry staple. One of my favorite fruits NOT to eat straight up but instead for DECORATION!!! CHEAP and BEAUTIFUL!